THUNDERBIRDS ARE GO! Episode 1 Review: Ring Of Fire | Warped Factor - Words in the Key of Geek. Thunderbirds are go! Again! Here's Elliott Rowe's review of the opening episodes of the new series. Back in 2013, just after the death of the great Gerry Anderson himself, it was announced that a new remake of ‘Thunderbirds’ was being produced. As a big fan of the original (through the revival in the 90s) this news made me ecstatic. It also left me a little wary after the *cough* disaster that was the 2004 live action movie, but the less we say about that the better. Over the following months and year titbits of information were fed to the fans. The return of David Graham as Parker, leaks of the redesigned ships, instantly recognisable as what they once were (like the TARDIS) but also given a fresh new look. The one sticking point for fans seemed to be the CGI, or the lack of puppets, especially after the recent spate of modern kids TV shows being trashed by sloppy looking CGI (Bob the Builder, Thomas the Tank Engine, Postman Pat). In the last few months the hype has been building. Finally the date was set. 4th April 2015. Easter Saturday. Ring of Fire Part 1&2 (episodes 1&2), gave us our first full experience of Thunderbirds Are Go! I’m going to work backwards from here so bear with me. Overall I’d probably say the episode was a good one. Nothing wonderful but certainly not bad. Score 7/10. One thing I will say is, I think they over faced themselves. The writer was so desperate to get every single element of Thunderbirds into the one episode. All 5 TB craft. Lady Penelope, the Hood, Kayo (Tin Tin), Brains, Jeff Tracy (or lack therefore of). Given that this was a double episode the pacing didn’t quite work, but it’s essentially a pilot episode so I’ll give them some leeway on that. The shoehorning of all 5 craft in the first episode didn’t work too well. Why have TB1 out of action if they were just going to launch it 5 minutes later? Why have Alan out on a space mission in the pre-credits? Those pre-credits themselves felt a little rushed. There was no build-up, but that’s okay, it wasn’t meant to matter who or what these people were doing, just that they needed saving. After the credits, the scenes on the Island were fun, creating a real sense of family between the characters (albeit a cliché with them hiding from Grandma’s cooking). 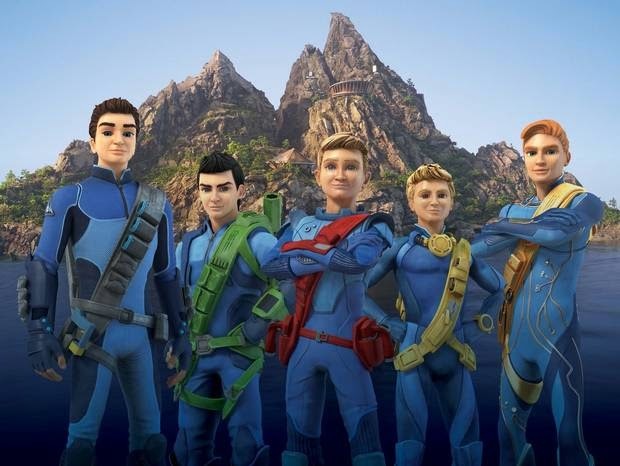 The main plot of the episode “seismic activity, sea base needs saving” is classic Thunderbirds, and the twist with it being man made is once again straight out of the Thunderbirds bible. The inclusion of the Hood towards the end felt a little shoehorned in, as did his conversation with Kayo (although the same could be said of the Hood’s soliloquy in ‘trapped In the Sky’). The exclusion of Jeff Tracy was a bold move, but like the destruction of Gallifrey in the new Doctor Who series I think it will give the show an ongoing plot arc. There were elements of the episode that could have been lost with no loss to the episode story, the awkward babysitter joke between Kayo and Alan was just cringe-y. Similarly the dialogue in the “oh look we’ve found a button” scene was pure exposition - “I say we press it (the button) and live with the consequences”. Just didn’t feel right. Having said that ‘Ring of Fire’ had to be a lot of things to a lot of people, it was essentially the hardest episode to write. It had to be new and fresh, yet not alienate older viewers, but not be too elite and set in its old ways to alienate new viewers. Plus I always lie on my philosophy not to judge any series by its pilot episode. Overall I think ‘Ring of Fire’ tried it’s hardest but you can’t please everyone. There will be some classic elitists who will bemoan everything about it and go back to their DVDs, and you know what? That’s okay. Because this isn’t their Thunderbirds. It’s not my Thunderbirds either. I’m just someone along for the ride. Ultimately you can tell that this was made with a real love for the classic series. Lots of hard work and passion has gone into it. I think if Gerry Anderson was alive today he'd love it.